Cecil believes PCRL now has more listeners than some of the commercial radio stations in its catchment area. The station deliverers its blend of music and chat with the help of 30 voluntary presenters and transmitters which broadcast from secret addresses around Birmingham. But it maintains a permanent base in Dudley Road, Edbaston, where listeners can drop-in and find out about fund-raising events and youth club and charity trips which are frequently organised. Cecil says: "PCRL break even through promotions and advertising despite the regular expense of replacing confiscated equipment -- and would thrive if made legal. Over the years he's made several attempts to persuade government to legalese the station, coming closest last year when plans were afoot to issue 26 experimental community radio licences in Briton. But the government abandoned the plan at the eleventh hour, dashing PCRL's aspirations once again. Cecil welcomes home secretary Douglas Hurd's recently unveiled proposals but admits he doesn't fully trust the government to be fair in administering radio reforms. "The government my try to legalese community radio in a way that would make it fail," he says. And PCRL is uncertain how much it would cost to turn in his scull and crossbones, although Cecil is confident any reasonable levies could be met by the extra advertising revenue legality would bring. Cecil Morris: "The Government may try to legalese community radio in a way that would make it fail"
In THE heat of the Handsworth Riot, one man felt he had a mission to restore peace and understanding. 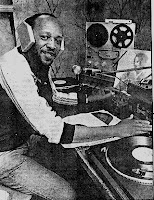 Cecil Morris took to the airways and with a team of community radio pirates transmitted all day, to try and calm the troubled streets of Birmingham. 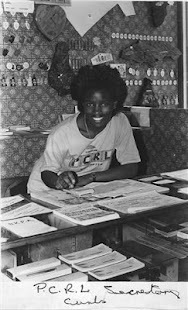 Since that day in 1985, the station Cecil founded -- The Peoples Community Radio Link - has rarely broken that continuous broadcast to an erea with a 25-mile radius. That takes in Coventry, where Mercia Sound has just announced it's intention of merging with Birmingham's BRMB in a likely bid for one of the new national franchise planned in a government shake-up of the airwaves. The shake-up should also create hundreds of community stations. And PCRL hopes to benefit after an insistent struggle to stay on the air despite the attempts of the Department of Trade and Industry to kill it off. In two, tough turbulent years the station has been raided 104 times and lost more than £130,000 of equipment, says Cecil. the air to tell people to keep off the streets of Handsworth," he says. "They had to be told what was happening so they wouldn't go and see for themselves and get caught up in it. 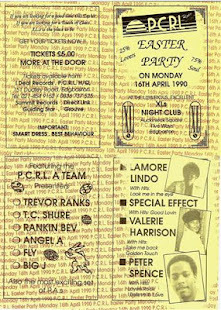 "We'd just launched PCRL, and decided to start broadcasting seven days a week, 24-hours a day. "At the time of the riot, we were giving out information and news. I think the entire black community was listening to us." Cecil claims PCRL also rapidly picked up substantial white audience, while striving to restore racial harmony. Now up-to half tuning into 103.5 FM to enjoy PCRL are white. After the riot, he saw no reason to wind down the station which gained popularity overnight. 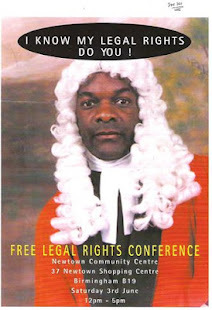 He maintains the refusal of legal stations to in Birmingham to provide comparable service made his stance necessary. 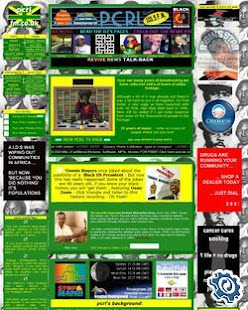 "I'd ask the stations to provide coverage for the Afro-Caribbean community in proportion to their numbers in the area." he says. "That would have meant 14 hours a week. I was offered a half-hour slot. It was very frustrating." 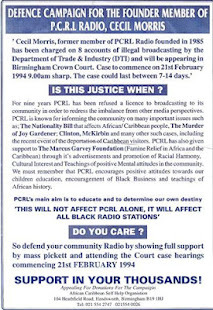 So, PCRL defiantly provided the service mainstream radio would have not, offering black music, news and views, influencing the coverage of its legal competitors. 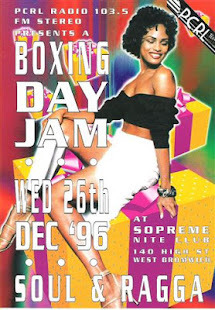 It survived through the support of advertising by small business and benefit concerts featuring sympathetic stars such as Jamaican reggae star Freddie McGregor.